Sources in the United States, South Korea and Japan reported that North Korea launched a ballistic missile over the weekend. North Korea has been hinting at an intercontinental ballistic missile test since the beginning of the year, but this was no ICBM. Reports indicate that this missile reached a height of 550 kilometers before impacting in the East Sea, 500 kilometers east of the DPRK. The US Strategic Command describes this as a medium or intermediate-range ballistic missile. South Korea’s Yonhap News Agency reported that Seoul’s Joint Chiefs of Staff initially assessed the missile as a Nodong medium-range missile, then changed their mind and said it was a “modified intermediate-range Musudan ballistic missile possibly equipped with a solid fuel engine.” Finally, North Korea’s Rodong Sinmun provided pictures of what it is calling the “Pukguksong-2, solid-fuel missile.” The pictures show something very similar to the KN-11 solid-fuel submarine-launched missile successfully tested last August, which North Korea calls the Pukguksong-1. 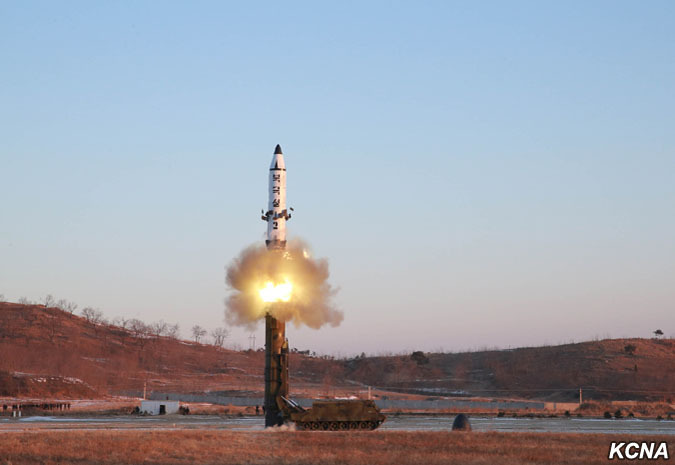 The Pukguksong-2 pictured during a test on February 12, 2017 (Photo: KCNA). We considered other alternate interpretations of this test, such as a failed or partial ICBM test in which only the first stage was functional, but the trajectory is not a good match for the first stage of any of North Korea’s known ICBM projects. With a much lower terminal velocity than an ICBM, it would not be terribly useful for testing ICBM-class reentry vehicles or other technologies. And while the launch site, a military airbase near Kusong, has previously been used for Musudan testing, the trajectory of this test was not a good match for the Musudan, either. The only plausible candidates for this trajectory are the proven Nodong medium-range ballistic missile, or the KN-11, and North Korea is showing us a land-based KN-11. Aside from the assessment by the JCS, this missile has little in common with the Nodong or the Musudan. It lacks the performance of the Musudan, though if launched on a more efficient trajectory it could reach a range of at least 1200 km rather than the 500 km just demonstrated – enough to reach targets in South Korea or parts of Japan. What this missile brings to the table is a much higher degree of mobility, survivability and responsiveness than the Nodong. The Pukguksong-2 was tested from a cold-launch canister system carried on a tracked transporter-erector-launcher (TEL) vehicle, which would provide substantially greater cross-country mobility than the Nodong’s wheeled TEL. The solid-fuel missile is more robust, and as it does not need tanker trucks to carry propellant its logistical footprint is smaller. And as it does not need to be fueled prior to launch, it can launch on perhaps five minutes’ notice compared to the thirty to sixty minutes required for a Nodong. All of these factors would make it much harder to find and preemptively destroy the Pukguksong-2. It takes more than a single test to ready a missile for operational service. And this test likely had a political dimension that may have affected the timing – it is almost certainly not a coincidence that North Korea launched a missile towards Japan, with the range to reach Japan but on a trajectory that deliberately dropped it into the ocean instead, on the day Japan’s prime minister was meeting the new US president in Florida. North Korea’s engineers presumably learned a great deal from this test, which appears to have been basically successful. We do not know how much more they need to learn to be confident that the new missile will function reliably in combat, and will look to the pace of future testing to gauge progress with this new system.